Data Flow Diagram (DFD) provides a visual representation of the flow of information (i.e. data) within a system. By drawing a Data Flow Diagram, you can tell the information provided by and delivered to someone who takes part in system processes, the information needed in order to complete the processes and the information needed to be stored and accessed. 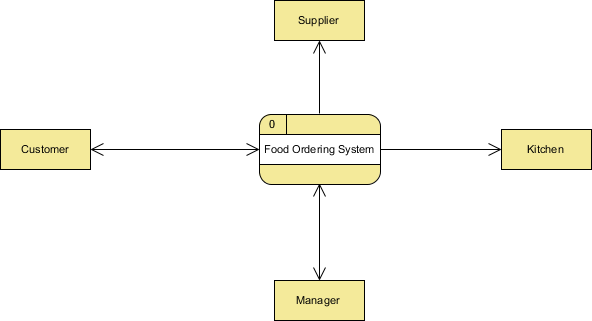 This article describes and explain Data Flow Diagram (DFD) by using a food ordering system as an example. The figure below shows a context Data Flow Diagram that is drawn for a Food Ordering System. It contains a process (shape) that represents the system to model, in this case, the "Food Ordering System". It also shows the participants who will interact with the system, called the external entities. In this example, Supplier, Kitchen, Manager and Customer are the entities who will interact with the system. In between the process and the external entities, there are data flow (connectors) that indicate the existence of information exchange between the entities and the system. Context DFD is the entrance of a data flow model. It contains one and only one process and does not show any data store. The figure below shows the level 1 DFD, which is the decomposition (i.e. break down) of the Food Ordering System process shown in the context DFD. Read through the diagram and then we will introduce some of the key concepts based on this diagram. 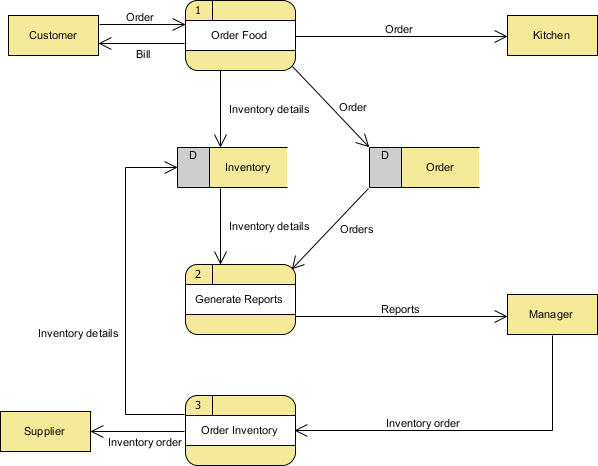 The Food Order System Data Flow Diagram example contains three processes, four external entities and two data stores. Based on the diagram, we know that a Customer can place an Order. The Order Food process receives the Order, forwards it to the Kitchen, store it in the Order data store, and store the updated Inventory details in the Inventory data store. The process also deliver a Bill to the Customer. Manager can receive Reports through the Generate Reports process, which takes Inventory details and Orders as input from the Inventory and Order data store respectively. Manager can also initiate the Order Inventory process by providing Inventory order. The process forwards the Inventory order to the Supplier and stores the updated Inventory details in the Inventory data store. Some designers may feel uncomfortable when seeing a connector connecting from a data store to a process, without seeing the step of data request being shown on the diagram somehow. Some of them will try to represent a request by adding a connector between a process and a data store, labeling it "a request" or "request for something", which is wrong. Keep in mind that Data Flow Diagram was designed for representing the exchange of information. Connectors in a Data Flow Diagram are for representing data, not for representing process flow, step or anything else. When we label a data flow that ends at a data store "a request", this literally means we are passing a request as data into a data store. Although this may be the case in implementation level as some of the DBMS do support the use of functions, which intake some values as parameters and return a result, in Data Flow Diagram, we tend to treat data store as a sole data holder that does not possess any processing capability. If you want to model the system flow or process flow, use UML Activity Diagram or BPMN Business Process Diagram instead. If you want to model the internal structure of data store, use Entity Relationship Diagram.